I wanted to can some dill pickles this year so I wouldn’t be tempted to pick up a jar or two of the pricey organic pickles from the store. Tom likes dill pickles, but not the bread and butter pickles that Joe and I scarf down in no time. I do like a dill pickle occasionally, like when I have a cheeseburger or some other picnic kinda food. We have plenty of fresh brine cured dill pickles in the fridge. In fact, I think we have 2 half gallon jars of them residing behind the raw milk. But those should be used up in a few weeks and I really wanted to preserve some dill pickles for the winter. The cucumber plants are slowing down considerably, with just a few fruits every other day or so. This weekend was pretty much the last chance to take advantage of the remaining cukes and a little bit of free time. It’s been awhile since I canned dill pickles. They usually turn out a little soft, but what the heck…homesteaders can’t be choosers. Here is my recipe, adapted from the one I found on the website for the National Center for Home Food Preservation. I added crushed garlic to mine, ’cause I like garlic dill pickles. If you don’t, leave the garlic out! Wash cukes and cut off blossom ends. Slice, quarter into spears, or leave whole and place in a large bowl. 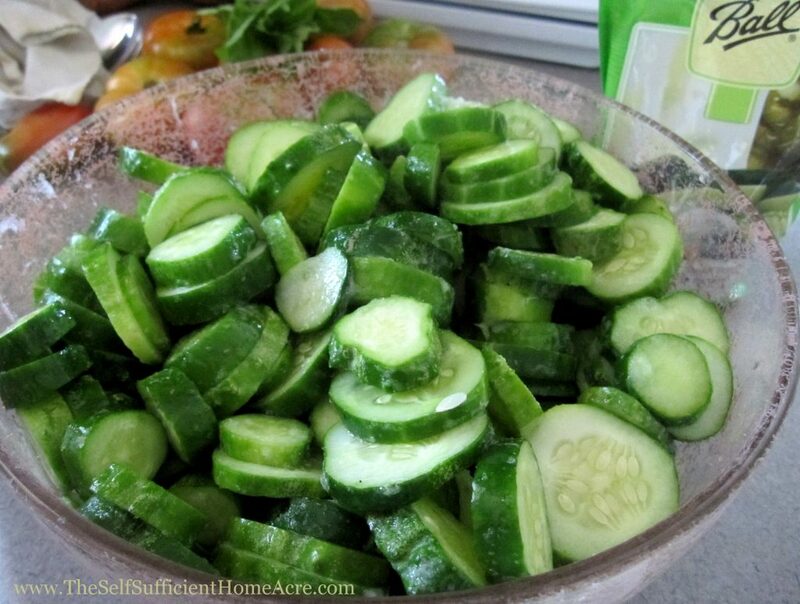 Sprinkle 3/4 cup pickling salt over cukes and stir to coat. Refrigerate and stir occasionally for 3 to 12 hours. Fill your water bath canner about 3/4 full with water, place on stove and turn to high. Clean your canning jars. When water is close to boiling, begin preparing your pickles. Rinse and drain cucumbers. Combine vinegar, 1/2 cup salt, sugar, 8 cups water in a stainless steel pan. Heat to boiling. While you are waiting for solution to boil, put your canning lids in a small pan with water and bring to a simmer. Sterilize your canning jars. Remove jars from water bath with jar lifter. Place on a towel on your counter and allow to cool out of drafts. When jars are cool, check to make sure they sealed. If the jar sealed, it will not push up and down in the center. Remove metal bands and wash jars. Store in a cool dry place out of direct light. Any jars that did not seal need to be stored in the refrigerator and used in 2 or 3 weeks. Let your sealed jars sit for a couple of weeks for the flavors to develop. I was lazy and used some crushed garlic in a jar from the fridge instead of peeling cloves of garlic. You can do the same if you want. I put a heaping tablespoon of the crushed garlic in the brine solution as it was heating. This recipe made 9 pints of pickles and I had some leftover brine solution. I poured the leftover solution into my half gallon jars of brine cured pickles in the fridge to give them a garlic flavor. I also used 2 heads of dill in each jar, for extra dilly flavor. What is your favorite kind of pickle? 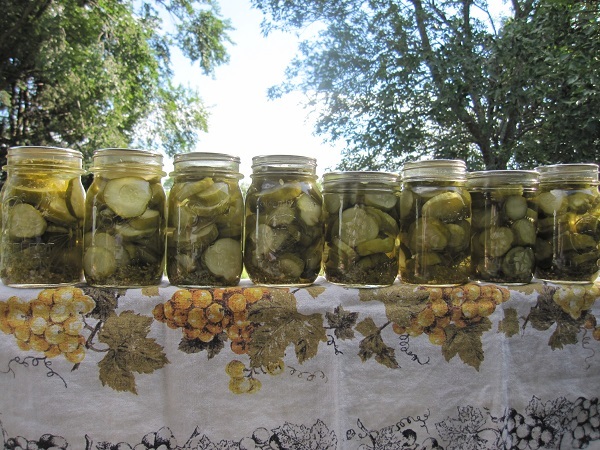 Do you make dill pickles too? 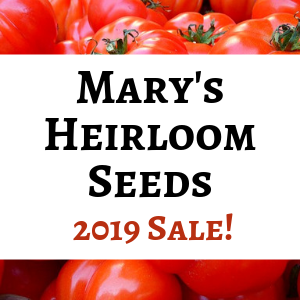 You know, more and more I am trying to go back to doing things that I used to do, but started getting busy and gave up on 🙂 When my son was born, I really stepped back from canning as much from my garden. But over the last few years I have jumped back into canning full force! I’m glad you like your pickles and everyone went nuts over them! Thanks for stopping by!